Originally published in 1903, James Allen’s As A Man Thinketh reveals the fundamental truth of human nature: “A man is literally what he thinks.” Allen’s deceptively simple principle has changed the lives of millions of readers, making As A Man Thinketh a classic bestseller for decades. Allen explains that our character, identity, ability, and success are all determined by the thoughts in our minds. Instead of finding ourselves victims of the world, there exists within each of us the ability to shape and define our own destinies. Finances, health, social status, and success are all external manifestations of the thoughts that populate our minds. Allen offers his readers an opportunity to seize control of their minds and in doing so create the lives they’ve always imagined. 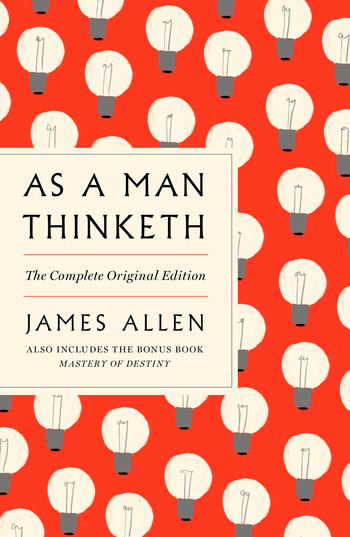 This new edition combines As A Man Thinketh with another of Allen’s companion works, Mastery of Destiny. In Mastery of Destiny Allen shows that the natural progression of human evolution is away from the evil that results from ignorance and towards ultimate good. Combined in one volume, these two books offer a revolutionary outlook of empowerment. James Allen was born in Leicester, England, in 1864. He took his first job at age 15 to support his family, after his father was murdered while looking for work in America. Allen was employed as a factory knitter and a private secretary until the early 1900s, when he became increasingly known for his motivational writing. His 1903 work As a Man Thinketh earned him worldwide fame as a prophet of inspirational thinking and influenced a who's-who of self-help writers, including Napoleon Hill.